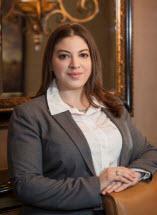 Amanda began practicing criminal and family law upon graduating from law school. She has extensive litigation experience handling various matters in court, always striving for the best results for her clients. Prior to moving back to Pennsylvania, Amanda handled many DUI and felony possession cases, along with family law matters, with a focus on divorce and custody proceedings. While maintaining her passion for criminal and family law, Amanda quickly became interested in a different type of law. Upon witnessing many individuals being deported by the courts, some being her own clients, Amanda gravitated towards Immigration Law. Building upon her criminal and family law cases, Amanda also began helping her clients who had immigration affects resulting from their criminal cases. Amanda has been able to put her Spanish speaking skills to work in a legal context, as many of her clients predominantly speak Spanish. She continues to build upon her practice, with a focus on the best results for her clients. In addition to her dedication to her clients, Amanda is also committed to giving back to her community. She is a volunteer with the Kennett Library Adult Literacy Program, helping educationally disadvantaged adults from the local community achieve their goals in learning the English language.